Designed to be retrofitted onto existing lines, SonoBraze is ideal for spraying aluminum brazing fluxes onto targeted areas. 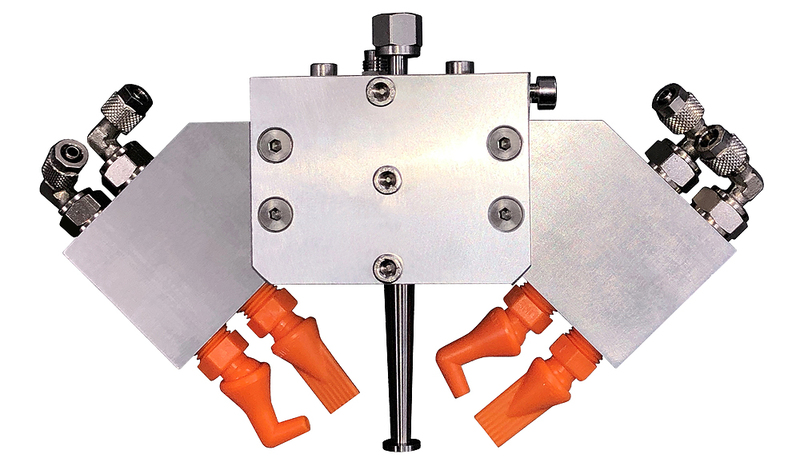 The system is a complete solution that includes the non-clogging ultrasonic nozzle(s), flux recirculation, and controls. 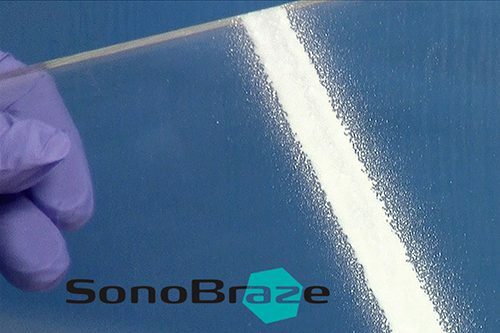 SonoBraze is ideally suited for Paint F Flux and standard brazing flux, and typically reduces consumption by 60% while reducing maintenance by over 90%. Designed to be retrofitted onto existing lines, SonoBraze is ideal for spraying aluminum brazing fluxes onto targeted areas for applications such as fittings, fins, baffles, pipe joints, radiators, heat exchangers, oil coolers, evaporators and condensers in industrial flux brazing processes. 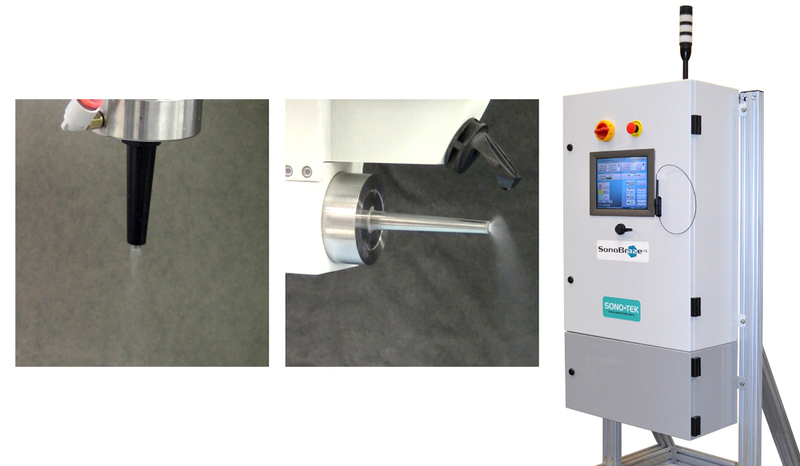 Replaces wasteful dip and pressure spray gun processes with non-clogging ultrasonic spray. Provides excellent uniform flux coverage while vastly reducing flux consumption, and lowering maintenance needs as well as overspray. SonoBraze is proven successful with several paint flux formulations, including Solvay NOCOLOK Paint F Flux as well as standard brazing fluxes. Our customers report savings of 60% in Paint flux consumption, while reducing maintenance by over 90%! The non-clogging performance of our ultrasonic nozzles is a dramatic and immediate process benefit compared to conventional pressure spray. 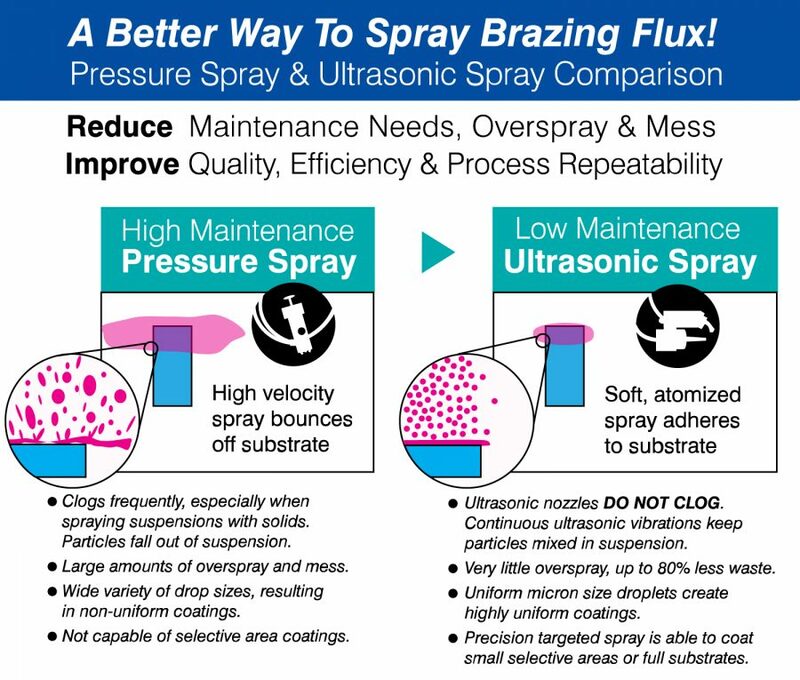 The unique atomized spray produced using ultrasonic nozzles results in drastic improvements in spray efficiency. 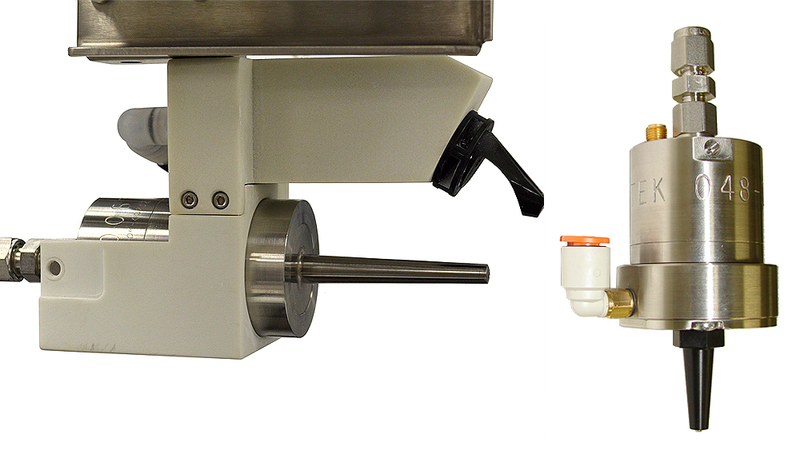 Unlike pressure nozzles, ultrasonic nozzles do not use high pressure to force liquid through a very small orifice. Instead, using a large orifice the high frequency vibrations are used to atomize the liquid into uniform, micron sized droplets. 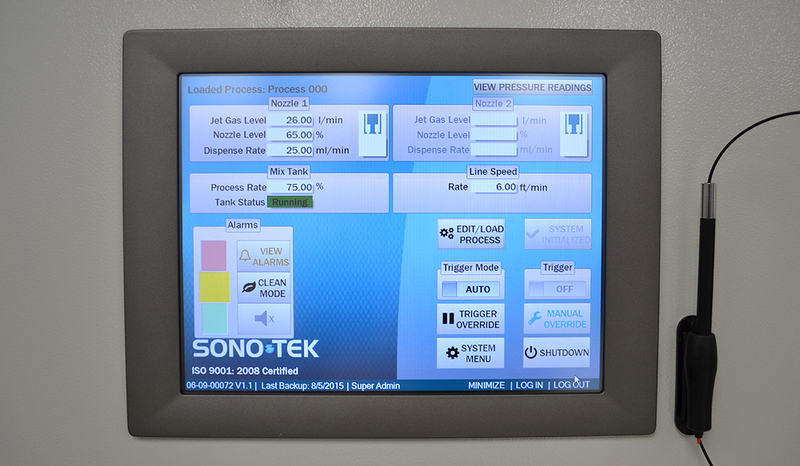 Read more about the unique nature of ultrasonic spray. One major benefit of ultrasonic spray compared to other application methods is the breakup of agglomerated particles as the suspension travels down the nozzle body. The liquid is subjected to continuous ultrasonic vibrations during the entire spray process, resulting in more efficient, homogeneous deposition of suspensions. And since it is a closed spray process there is no concern for open air drying of flux/binder mixture during the process. The SonoBraze system is configured with one of 3 different low velocity air shaping systems: AccuMist: 0.24-1.5 inch (6-40mm) spray pattern, Impact: Up to 6 inch (15 cm) spray pattern, or Extend: Up to 9 inch (24 mm) spray pattern, depending upon application requirements. Ability to spray small, targeted areas with AccuMist nozzle. Ability to spray large wider areas with Impact nozzle. High transfer efficiency minimizes overspray.